The Streamline® Compounding Aseptic Isolator (CAI) is suitable for work involving non-hazardous drugs. The work zone and pass-thru interchange are under positive pressure to the room in order to maintain sterility in case of a breach in the barrier isolation system. Sentinel Gold™ Microprocessor controller supervises all functions and monitors airflow and pressures in real-time. Work zone and pass-thru interchange are under positive pressure to the room in order to maintain sterility in case of a breach in the barrier isolation system. Airlock pass-thru interchange ensures main work zone remains sterile during insertion and removal of items. Robust dual-wall construction. All positive pressure work zones are surrounded by negative pressure plenums at the sides and back. Unique Esco Dynamic Chamber™ plenum surrounds filter seals with negative pressure. Ergonomically angled front and oval gloveports improve reach and comfort. Safe-change cuff rings permit glove changes with zero risk of contaminating the work zone. One piece work zone liner with no crevices is easy to clean. Esco Isocide™ antimicrobial coating on all painted surfaces minimizes contamination. Sharps disposal system and hydraulic height-adjustable stand are available as options. 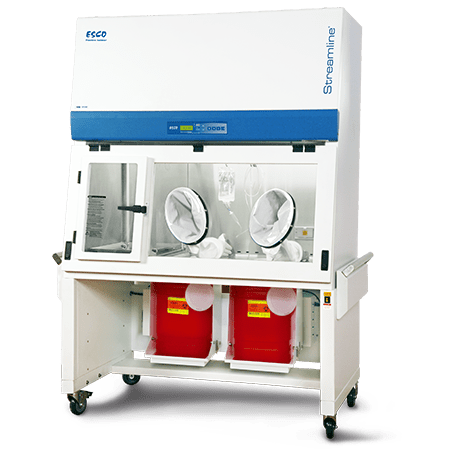 Esco's Streamline® Compounding Aseptic Isolator is available as a standard bench top unit. Additional accessories are available for further enhancement.